LEONARD, ALBERT HARRIS (1839-1917) was born June 15, 1839, in Mobile, Alabama, where his father was in the steam boating business. Leonard's early years were tied closely to steamboats and rivers. The family moved to Shreveport in 1849, where his father managed the Palmetto Hotel from 1850 to 1852. After a two-month stay in Jefferson, Texas, the family returned to Shreveport, rented a tavern on the Texas Road and all family members worked to run the tavern. At age fifteen Leonard began work with the Clerk of the District Court of Caddo Parish. In 1858, he became a law student and was elected clerk for the Police Jury and Secretary of the City Council. When the Civil War broke out, Leonard, then twenty-two, enlisted as a Pvt. Co. A, 1st (Nelligan's) La. Inf. "Caddo Rifles," En. April 28, 1861, New Orleans, La. and was wounded in 1862. After the war, he returned to Shreveport and was admitted to the bar in 1866. He was elected clerk of the Caddo Parish District Attorney’s office, but resigned that post to form a law partnership with Capt. L. M. Nutt, under whom he had previously studied the law. The partnership continued until 1872 when Leonard was elected State Senator. He held office until 1876. In 1877 he became United States district attorney for the Eastern District of Louisiana, a post he held for twenty years. He retired and returned to the practice of law in partnership with Fred G. Thatcher and later with E. H. Randolph and Allen Rendall. In 1879, he married Lucy Lee Howell, daughter of the Mayor of Shreveport, John M. Howell. They had one daughter, Cecelia. When he finally retired from his law practice, Leonard devoted himself to planting and banking. He owned and operated several large Red River plantations, developing much of the land south of Shreveport. He was president of Merchants and Farmers Bank, which he founded with Leon M. Carter and Peter J. Trezevant. 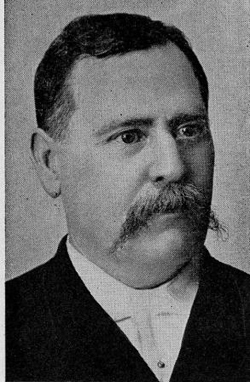 With Col. H. J. G. Battle, he co-founded the Shreveport Times in 1871. He was also identified with the first company to bring natural gas into the City of Shreveport. Leonard died in Shreveport, Louisiana, October 19, 1917, and is interred in Oakland Cemetery in Shreveport. Bibliography: Lilla McLure and J. Ed Howe, History of Shreveport and Shreveport Builders (Shreveport, LA: J. Ed Howe, 1937), 294; David Hill, "Albert Harris Leonard," (Find-a-Grave, http://www.findagrave.com/cgi-bin/fg.cgi?page=gr&GRid=11024152 .... accessed 13 March 2013). "LEONARD, ALBERT HARRIS" Handbook of North Louisiana Online (http://www……. ), accessed …………. Published by LSU-Shreveport. The statements found on this page are for informational purposes only. Every effort is made to ensure that this information is up to date and accurate.